Braving the chilly night air wrapped in multiple layers, attendees at Sierra Hospice’s Memorial Tree Lighting hold candles while listening to the names of loved ones who had passed during the year. More than a dozen people gathered Dec. 2 at Sierra Hospice’s 32nd Annual Memorial Tree Lighting ceremony in Chester at the Sierra Hospice building located near Seneca Hospital to memorialize those who had passed during the year. 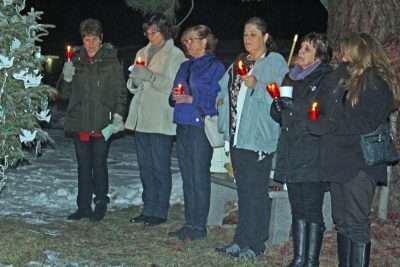 It was a solemn and dignified occasion, with Sierra Hospice coordinator Lisa Miller welcoming those in attendance, many of whom held candles while braving the chilly night air wrapped in multiple layers, knitted caps and gloves. The opening ceremony began with the naming of those departed, performed by Shirley Canelia, Mary Ellen Rosen, and Sue Haltom and included patients who were assisted in their final days through hospice care. Family members and friends had purchased ornaments to hang on the tree in remembrance of a loved one now deceased, as well as the names of local military personnel who have been lost serving our nation. The Lake Almanor Handbells Ensemble performed near the end of the event, directed by Meridith Rosendahl, and also included Suzanne McDonald, Lowell Rosendahl, Carol Smith, and Nick Smith. The Memorial Tree was finally lit up with Christmas lights at the end of the ceremony, and a moment of silence followed for those in attendance to remember family and friends who are no longer with us, said Miller. The event serves as the culmination of Sierra Hospice’s yearly fundraising activities to help cover the costs of patient care. 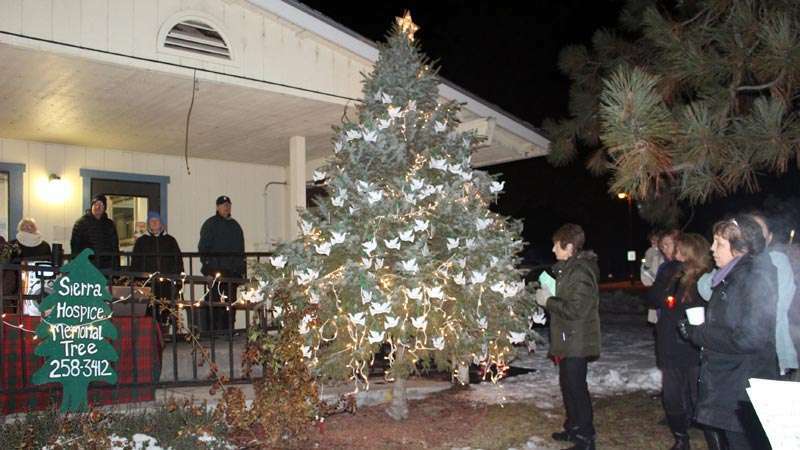 As a way to raise funds to help hospice in its mission to provide free, end-of-life care for patients and to emotionally support their families, Miller said that community members purchase tree ornaments in memory of their loved ones. 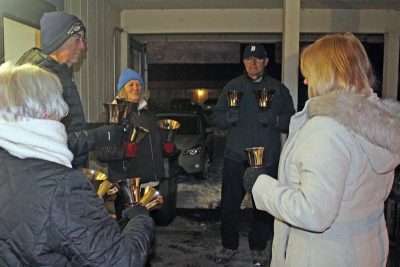 The Lake Almanor Handbells Ensemble, directed by Meridith Rosendahl, performs at Sierra Hospice’s Memorial Tree Lighting ceremony on Dec. 2. From left: Meridith Rosendahl, Nick Smith, Suzanne McDonald, Lowell Rosendahl, and Carol Smith. Anyone in the community who wants to support the organization can buy ornaments, she said, regardless of whether or not they know someone in the hospice program. Miller said caring individuals could buy “annuals,” that cost $10 per ornament, or three ornaments for $25, available for purchase by calling the Sierra Hospice office at 258-3412. Also available are “perpetual” white dove ornaments for $100, which can be bought once and placed on the tree every year with the name of a loved one on it. Buying ornaments is a perfect way to honor and cherish those who are no longer with us during the year and especially during the holiday season, said Miller. The memorial tree remains lit 24/7 until the new year. Following the somber observance, an indoor reception was provided that included refreshments and homemade snacks, along with hot beverages like coffee and hot chocolate. The room provided a space for people to offer their support and fellowship with others in attendance.